The faucet that you select to install in your modern kitchen will become a focal point for the entire room while doing double duty as a hard-working tool to help you prepare and clean up after meals. Choosing a faucet for your kitchen sink is no small chore, especially since there are so many beautiful options out there. Let's take a look at the top faucet choices for today's kitchen. Pull-out faucets are largely heralded for their functionality and are immensely popular among discerning cooks everywhere. Our top choice is the Delta Pilar with Touch20 Technology in a brilliance stainless finish that is perfect for accentuating quartz or granite countertops. The Pilar kitchen faucet saves water and energy by starting and stopping the flow of water with just a tap anywhere on the spout or handle. Designed with a MagnaTite spray head docking system and Diamond Seal technology to ensure a tight fit and leak free operation for years to come. This faucet is a market leader and exceeding consumer expectations by leaps and bounds. 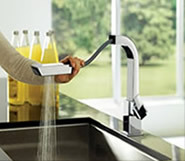 You won't be disappointed with this purchase if you are looking for an innovative and durable pull-out kitchen faucet. 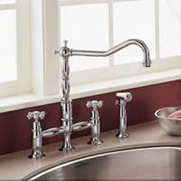 The bridge style faucet is so very appealing in "period" kitchen like those that reflect a country or colonial décor. If you are having trouble choosing between contemporary and traditionally designed kitchen faucets, a two-handle faucet can work well with both. 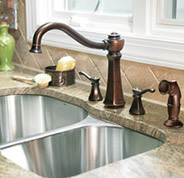 One that we really like is from Moen - the Vestige Two-Handle Kitchen Faucet with Side Spray in oil rubbed bronze. We like the high-arc design and attention to detail, which create an Old World look that goes well with both your kitchen and bar sinks. Plus the Vestige Collection has tons of fixtures, accessories and finishes to choose from to coordinate your kitchen and bath! For the serious gourmet we chose the Danze Parma Single Handle Pre-Rinse Kitchen Faucet in stainless steel. Danze created the Parma with a stylish and practical pull-down spout that lets you put the water where you need it. This faucet has a ceramic disc valve for long lasting durability and a towering 22 inch high spout to handle the biggest of cookware. But don't let the size of this faucet fool you to think it's cumbersome. With a light touch of your finger The 2 function spray head easily adjusts from a steady, aerated flow to a powerful spray on a spring action wand head to make cleanup simple and effortless. Our pick for the contemporary kitchen is the Moen 90 Degree Single Handle Pull-Out Kitchen Faucet in a classic stainless finish. With its ultra-contemporary styling, the 90 degree faucet brings a clean, minimalist aesthetic to your kitchen – along with smart pullout functionality that provides superior spout reach for large pots and pans. 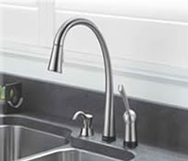 The 90 degree comes complete with Hydrolock quick connect installation and the superior Duralast 1255 cartridge, which makes your faucet feel brand new even after many years and thousands of uses. This faucet has all the aesthetic appeal and proven internal technology to last a life time.